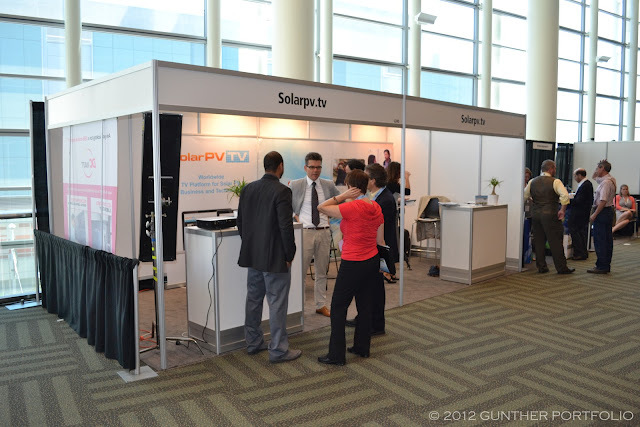 Select Photovoltaic News Tidbits from Intersolar North America 2012. 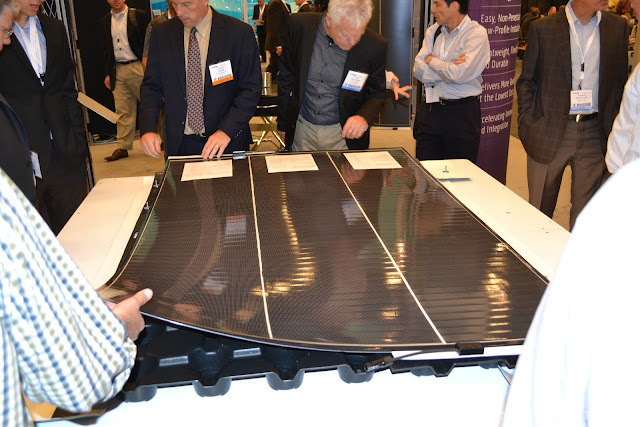 Finding noteworthy nuggets at Intersolar North America was challenging. Here are a few that caught my attention or relate to prior portfolio posts. I heard about this one at PV America from someone I won’t name. 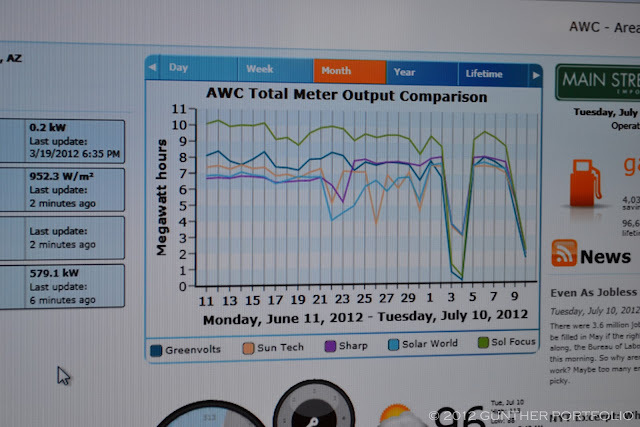 I managed to snap the above photo of the performance monitoring screen for the 5 MegaWatt (MW) Arizona Western College (AWC) solar array from the past month. The SolFocus 1 MegaWatt (MW) Concentrating PhotoVoltaic (CPV) installation is outperforming the 1 MW equivalent GreenVolts CPV installation by almost twenty-five (25) percent! In fact, the 1 MW single-axis tracked, tandem-junction structure (amorphous silicon/microcrystalline silicon) thin film from Sharp Corporation (TYO:6753) has also been outperforming GreenVolts for the past few weeks. 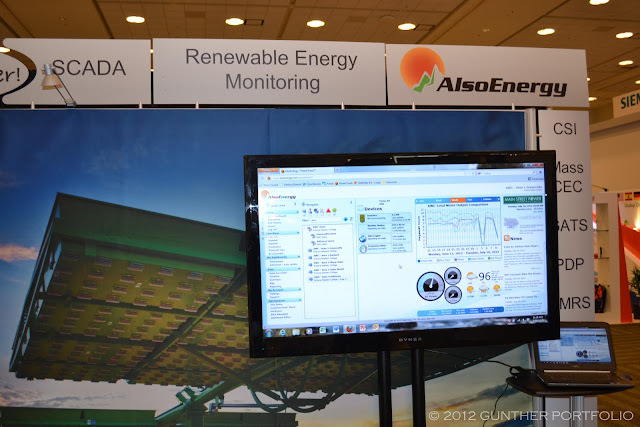 AlsoEnergy provides comprehensive and customizable monitoring solutions for more than 600 solar power plant sites worldwide including the AWC solar array for Main Street Power Company, Inc.
Sanmina-SCI Corporation (NASDAQ:SANM) displayed the heliostat building block manufactured for eSolar sans mirror as part of a partnership to deliver “local content-optimized component design and manufacturing” for utility scale CSP (Concentrating Solar Power) plants. 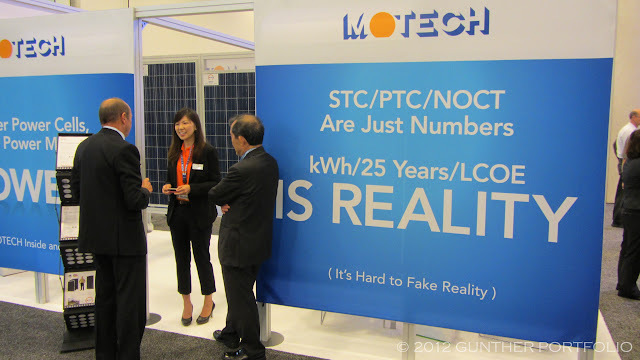 Beside promoting the Reality of kWh (kilowatt-hour) generation, a 25 year warranty, and LCOE (Levelized Cost of Energy), Motech Industries Inc. (TWO:6244) was keen on their IM72 Series Photovoltaic Modules with 285 to 295 Watt-peak (Wp) maximum output power from seventy-two (72) multicrystalline solar cells. Motech’s Newark, Delaware USA, PV module facility with 40 MW annual capacity is producing from 20 to 30 MW of modules predominantly for orders requiring the Made in USA designation. 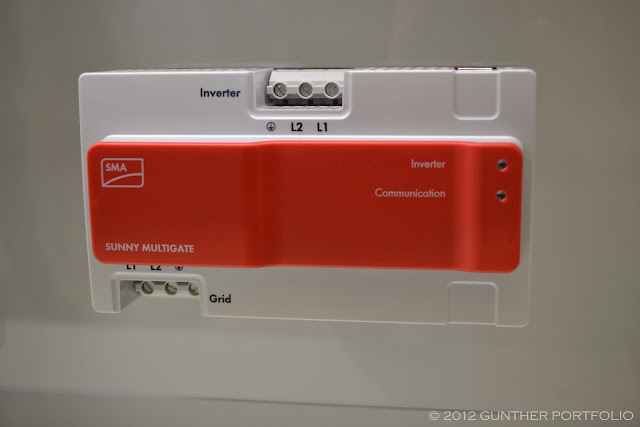 SMA once again had the Sunny Boy microinverter on display under glass. There is now preliminary technical data subject to change available for two models, the Sunny Boy 200-US and Sunny Boy 240-US with 200 Watt and 240 Watt rated AC power (@ 240 V, 60 Hz) respectively as per normal SMA product model numbering convention. 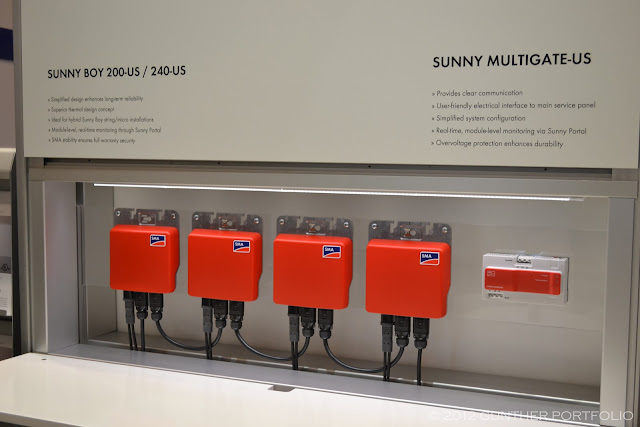 Also on display was the Sunny MULTIGATE-US (previously called the Sunny Boy 240 Power Gateway) for connection to the service panel and the communications gateway between module level monitoring and the Sunny Portal in the cloud. I caught up with SolarPV.TV CEO Tomasz Slusarz between takes as it were. Be sure to check out the SolarPV.TV “Intersolar NA Special Issue – US Market Update; New products launch: PanelClaw and SolarBridge; Global Alliance of Solar Energy Research Institutes” and other upcoming video reports from Intersolar North America. 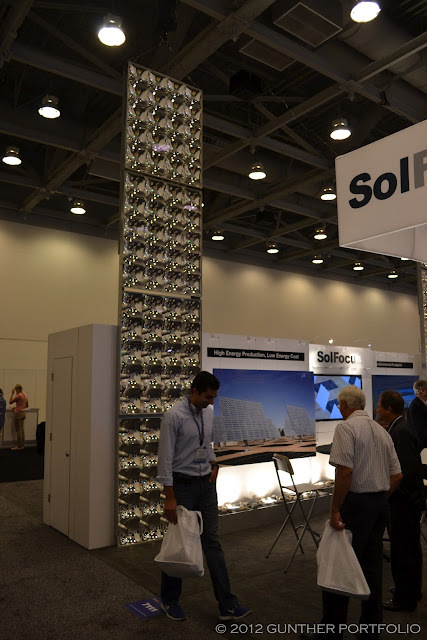 The SolFocus stand at Intersolar North America was hopping with visitors on the first day of the exhibition. SolFocus displayed their equivalent of a “MegaModule” officially called Multi-Panel Assemblies (MPAs) consisting of four (4) SF-1100P concentrator panels with nine MPAs in each SF-1136SX CPV array. 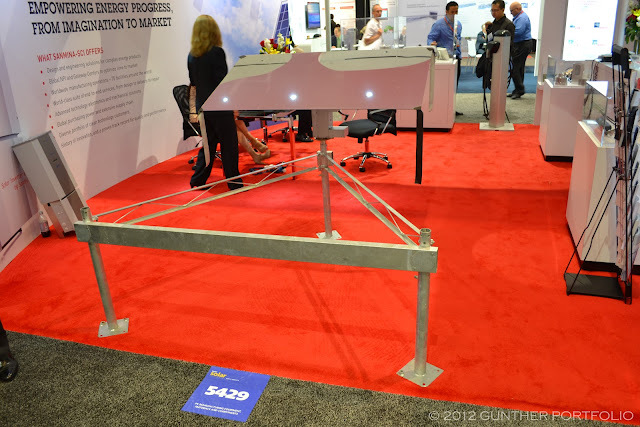 When I saw the folks gathered around the SoloPanel SP3S table display, I thought “It’s déjà vu all over again.” I was reminded of a similar scene from the stand of you know who at Intersolar North America 2009. I confirmed this was an SP3S by counting the one hundred fifty-three (153) series connected CIGS (Copper Indium Gallium diSelenide) solar cells. 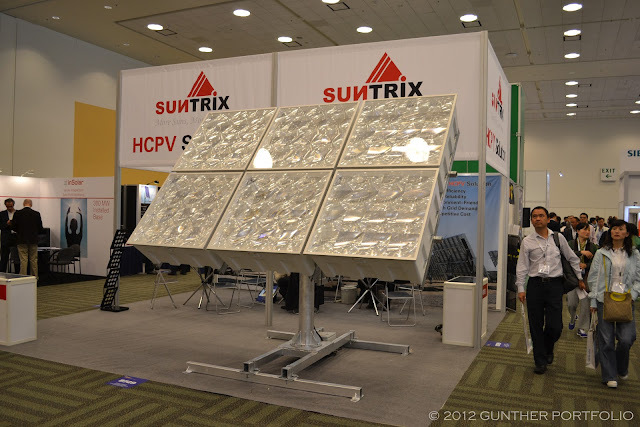 Suntrix brought a scaled though component accurate six (6) panel version of their SCPV-500 (Suntrix Concentrator PhotoVoltaic) system to San Francisco in order to test the US utility scale solar market. 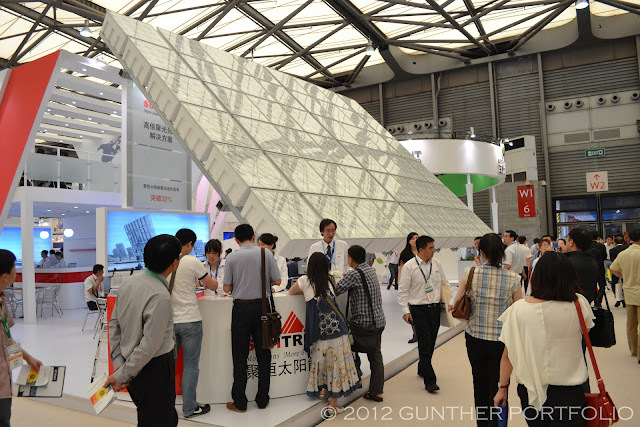 The largest T48-SCPV-500 system was on display two months ago at the SNEC PV POWER EXPO 2012 in Shanghai, China. At SNEC, a credible source explained that although China’s northwestern deserts do receive high Direct Normal Irradiance (DNI), it is mitigated on the ground by sand and dust storms. Fresh from the Solar Triple Crown victory, Trina Solar has not rested on its laurels with the announcement of second generation Honey technology called Honey Ultra at Intersolar Europe. With sixty (60) 156 x 156 mm (millimeter) multicrystalline silicon solar cells, the Honey Ultra module achieved 284.7 Wp power output as confirmed by TUV Rheinland. Honey Ultra cells increase efficiency through a combination of cell texturing, thinner bus bars and fingers, reduced cell reflection, and a highly reflective back foil. With “superior performance under low light conditions and at high temperatures”, Trina expects Honey Ultra to be available commercially in early 2013. The “Product Introduction Honey TSM-PC/PA05A” PowerPoint presentation covers the first generation technology. 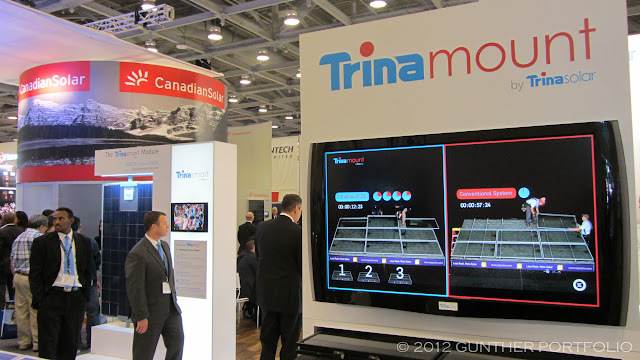 Trina also launched the Trinasmart Solution In North America combining Trina PV modules with a power maximizer and monitoring technology through a collaborative partnership with Tigo Energy, Inc. The first Trinasmart platform Solution Series will integrate the maximizer into the junction box of the Honey PA05A and maybe the TSM-PA05 PV modules and be available in Fall/Winter 2012. While waiting, I spent a few moments looking at the Trinamount display and could not figure out where the oval shaped socket on the hammer like tool fit. I guess I need some training. TSMC Solar North America Vice President & General Manager Stephen McKenery said initial US shipments of the TS CIGS Series High-Efficiency CIGS Solar Modules with 120, 125, and 130 Watt-peak (Wp) maximum power ratings would begin in the late August to September timeframe for installations in October and November 2012. 140, 145, and 150 Watt-peak CIGS modules should commence shipment in 1Q13 (first quarter of 2013). Mr. McKenery emphasized TSMC Solar is still R&D (Research and Development) focused and is not manufacturing CIGS modules at the TSMC Solar 100 MW nameplate capacity. TSMC Solar is a subsidiary of Taiwan Semiconductor Mfg. Co. Ltd. (NYSE:TSM). 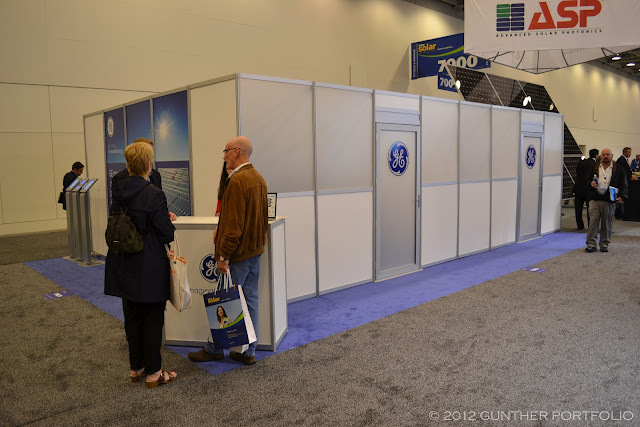 There was a distinct lack of ecomagination at the GE Energy meeting room stand. 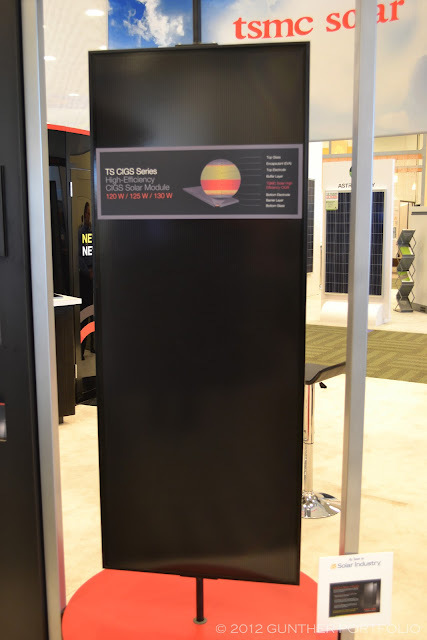 Perhaps there was nothing to talk about after delaying the construction of the GE PrimeStar CdTe (Cadmium Telluride) solar module manufacturing facility for at least 18 months. “PrimeStar founder Brian Murphy on GE layoffs, Aurora solar plant delay, technological doubts” by Sam Levin for the Denver Westword Latest Word Blog pretty much says it all. I’m very interested in Sol Focus’ mega module that they introduced at the show, it looks like a hi-tech solar energy renewing monster! Jeez!! Although Suntrix’ attribute to be able to be stationed on desert terrain makes it invaluable, as not all models of PV systems can be perfectly ground mounted.